One of my not-so-secret desires/loves/addictions is vintage toys. 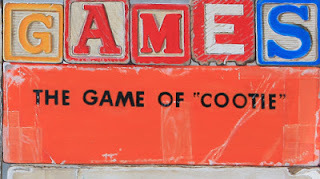 That includes games. 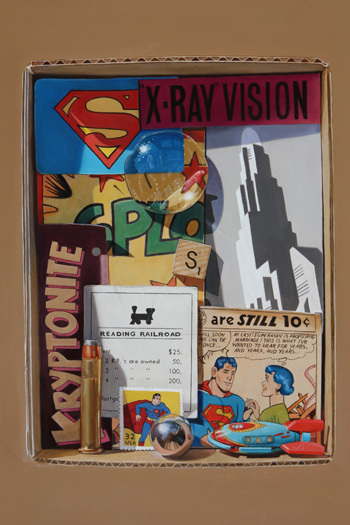 I've been wanting to include a game in a trompe l'oeil painting for a long time but have been pondering on the 'right' composition. I finally decided on stacked boxes. I like the geometrical design of rectangles and squares stacked on top of each other with a few little 'surprises' thrown in. 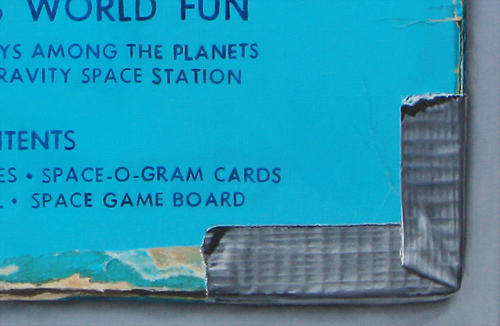 Of course, these pre-owned games have been played with over the years and show the knocks and bruises of life. And I love all the color! 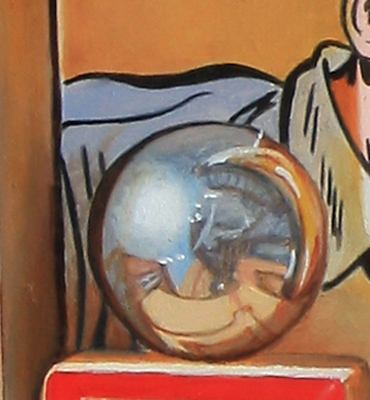 This is just a small bit of the tromp l'oeil oil painting I'm currently working on. I'm having so much fun with it, I couldn't wait to show it to you. 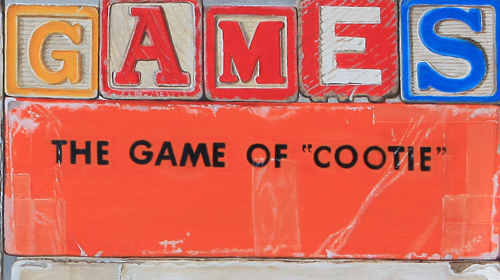 As you probably know, I'm addicted to vintage toys and thrift stores. As I was whining to Hubby one day about all the tape they use in thrift stores and how it ruins the boxes he said "Why not paint the tape too?" Duh! 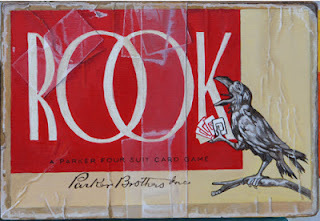 I paint tape all the time in my tromp l'oeils and here it's already been added to this Rook card game. Ok, my secret is out. I love vintage cowboy figurines. Alright, it wasn't much of a secret. I collect them. I display them. I love them. 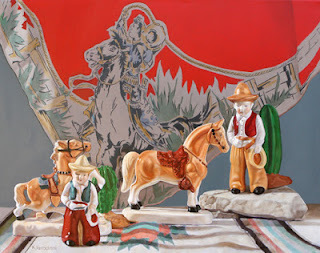 The background features a silk scarf with a wonderful picture of a cowboy on a horse. 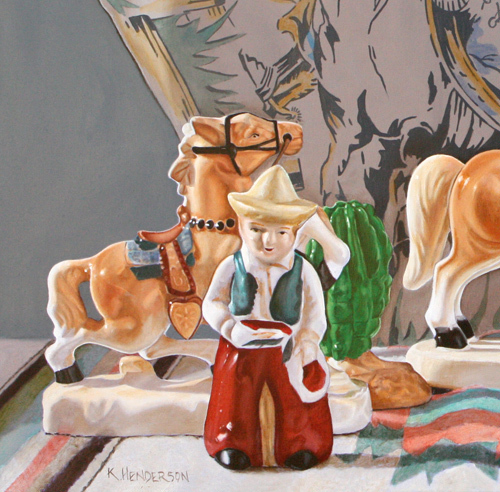 Each ceramic cowboy has his own palomino horse and a cactus to show us he is in the Southwest. I like the hard, shiny figurines against the soft texture of the scarf and rug. 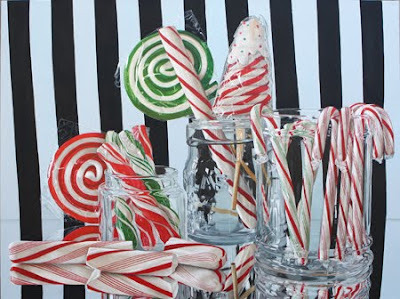 Stripes and Reflections! My two favorite subjects to paint. 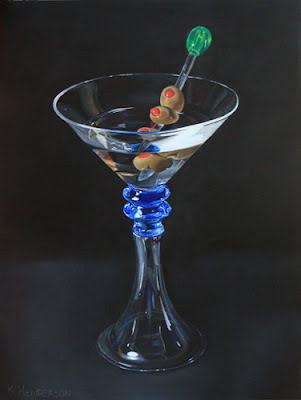 I took many reference photos for this painting. I set up this still life on the deck of my house. 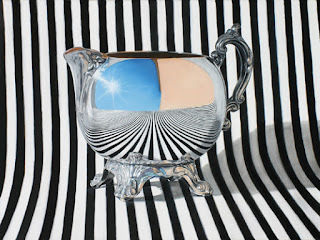 The reflections show the Blue New Mexico Sky, my pink stucco house and black and white striped fabric. 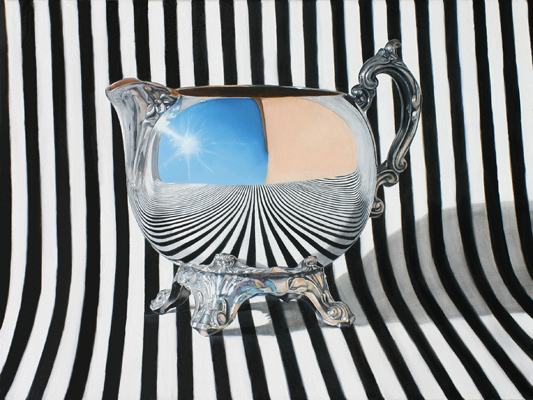 The vehicle for the reflections is an antique silver creamer that belonged to my mother. 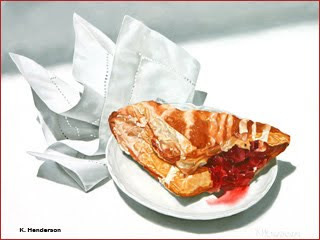 I'm thrilled that my painting, "Baked Goods" was juried into this great art show, sponsored by the National Oil & Acrylic Painters Society. Tuesday through Friday 5—10 p.m. 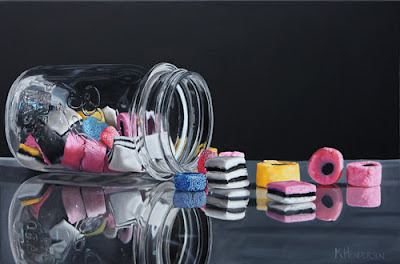 It has been ages since I posted a new contemporary still life painting! But it's not because I haven't been in the studio working. One of the pieces I have been working on is this trompe l'oeil. This is just the center detail of the painting. It's another in my Super Heros series. I'll tell you the story behind it when I post the finished painting. In the mean time, take a look and tell me what you think. tran·si·tion/tranˈziSHən/ Noun:The process or a period of changing from one state or condition to another. "Superman fights a never-ending battle for truth and justice, disguised as a mild mannered newspaper reporter Clark Kent." 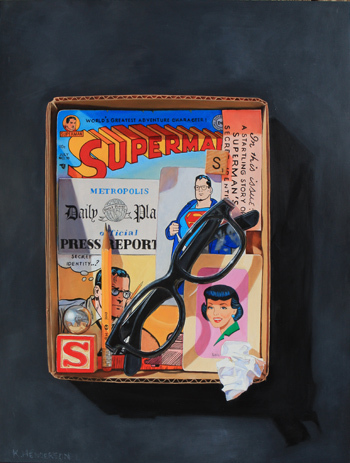 This Trompe L'Oeil painting shows the transition between Clark Kent and Superman. 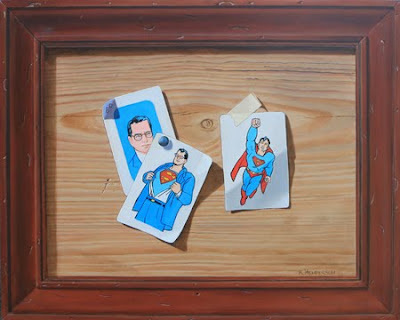 And, yes, the "Frame" is part of the painting. 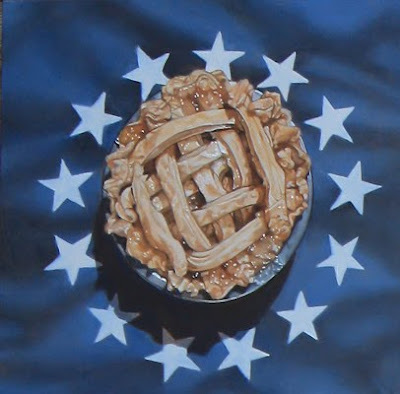 I'm proud to invite the public to the 2012 Best of America National Oil & Acrylic Painters’ exhibit. 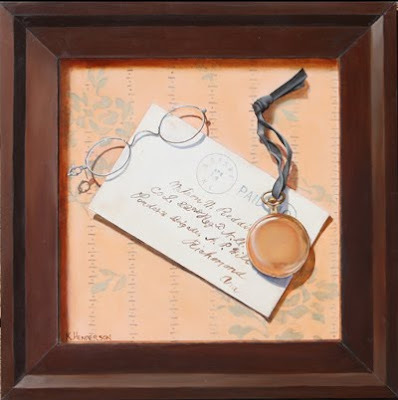 Art lovers will get the pleasure of viewing a juried selection of various artworks from talents all around the United States. 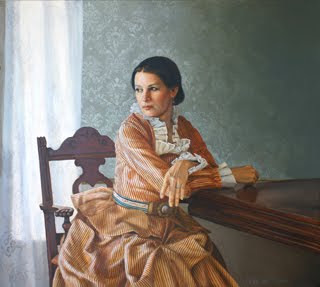 The Opening and Award Ceremony will begin on October 14, 2012 at 1pm at the Dunnegan Gallery of Art located at 511 N. Pike Ave, Bolivar, MO 65613. Artwork will be showcased there until October 28 at which time the gallery exhibit will be moved to the Lake of the Ozarks, MO. 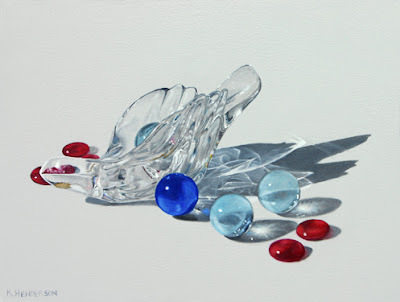 My Contemporary Realism Painting website has a new look. It should be easier to find the painting you want. 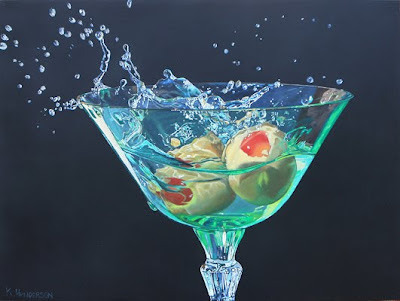 The images are cropped on the index page so be sure and click the thumbnail to view the actual painting image. 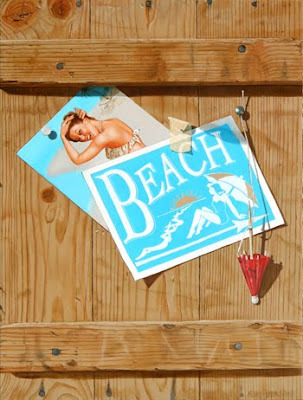 The enlarged image will also give you information about the paintings location and availability. What can I say? 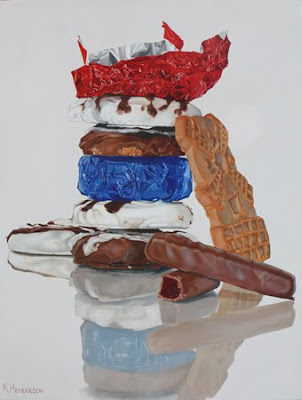 This is a painting of stacked cookies and their reflection. I love those windmill cookies, don't you? Yum! 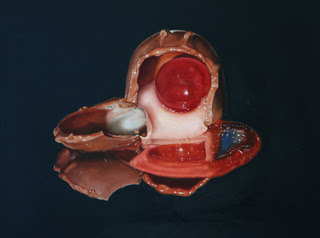 This painting is another trompe l'oeil in my Chocolate Kiss series. 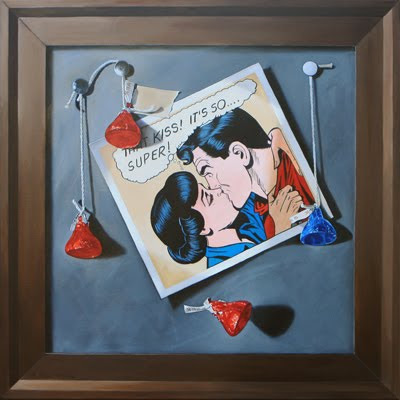 This includes a panel from a Superman Comic and of course that's Lois Lane giving the Super Kiss. The American Chocolate fund's goal was to send 1000 pounds of chocolate EACH WEEK(!) to the American Expeditionary Forces in France. Wow! 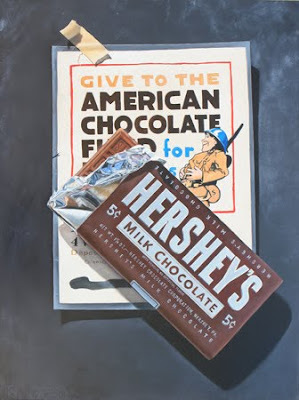 This Trompe L'oeil includes the poster along with a Hershey's Chocolate Bar in a World War II era wrapper. 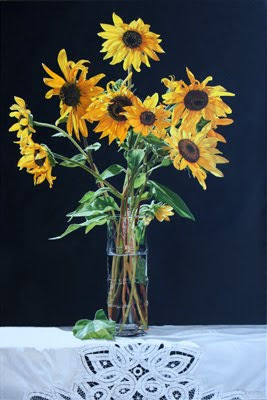 This painting has been selected as a finalist in the 2011/2012 Art Renewal Center Salon Competition. This is an international, online show and had over 2,100 entries. 500 paintings were selected as finalists. Every once in a while I fall into the bad habit of starting paintings. Lots of them. Currently, I have about 10 paintings in progress. The good news is that I will have 10 new paintings to share within the next few weeks. The 'bad' news is that I haven't posted any new work for a while . 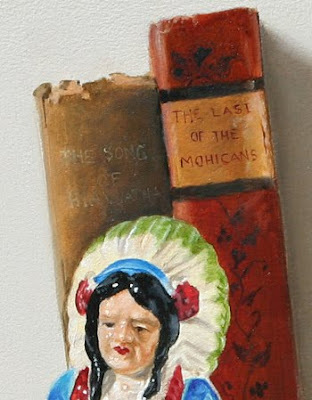 So, I thought we could revisit a (not so old) friend, The Last of the Mohicans. 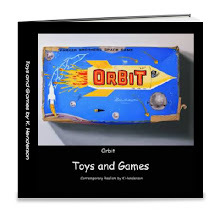 As we all know I love old books, toys and other fun things. 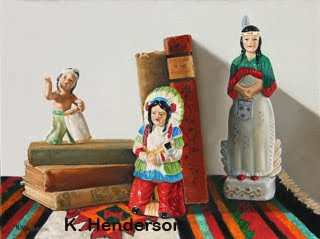 The vintage American Indian ceramic figurines are part of my collection and make me smile every time I look at them. And these books have an average age of 100 years. Yes, Last of the Mohicans is one of them. 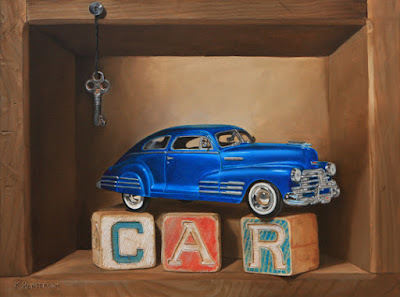 This Trompe L'Oeil is a bit of a departure for me but so much fun! 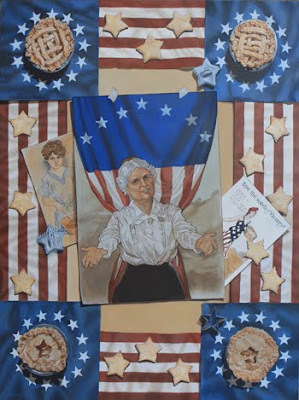 This homage to mothers has the Stars and Stripes created by Betsy Ross, the Mother of our flagAlso included are poster images of Mom as she was depicted during the first half of last century and little Apple Pies. Its completed with star shaped cookies just like mom used to make. Yum! 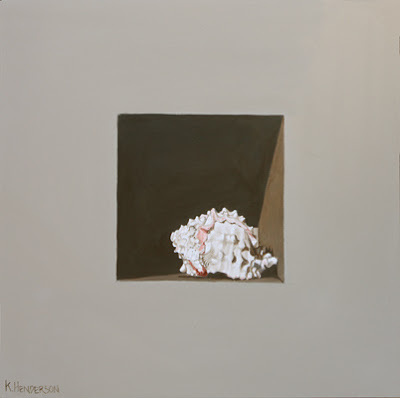 Salon International 2012 is the eleventh annual juried exhibition. 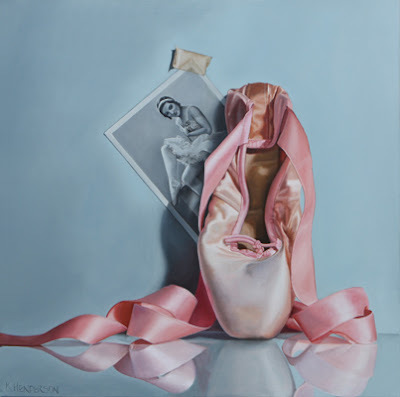 It will feature 434 original oil paintings selected from artist entries from around the world. 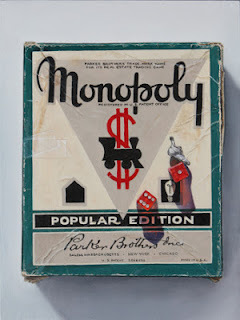 The Opening Reception will be April 14 - 5-8:00 pm. 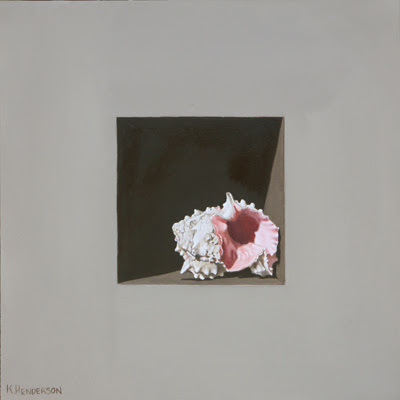 The paintings will remain on exhibit until May 4. Can't make it to the show? It's online! 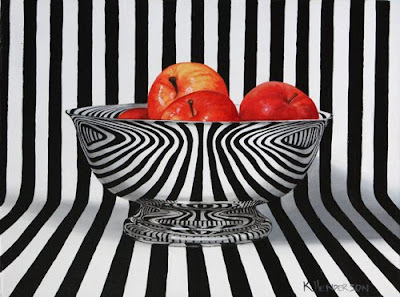 This competition will feature the finest in representational figurative, portrait,still life, floral, landscape, interior, wildlife, and western themes. The Salon will be hosted by The Legacy Gallery in Scottsdale, AZ and will utilize the 10,000 sq. ft. upper level of the gallery. 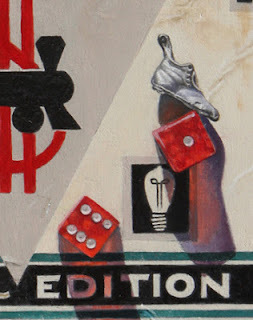 Again, I chose a limited palette using only raw sienna, white and cadmium red. I love the slight amount of pink in this one. 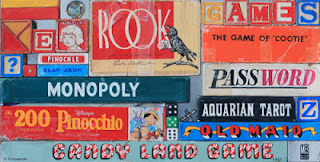 For those of you that will be in New Mexico in the next few months, be sure and stop by The Hubbard Museum of the American West for their Biennale Grande show. The Opening Reception will be April 7, 1:00 - 3:00. 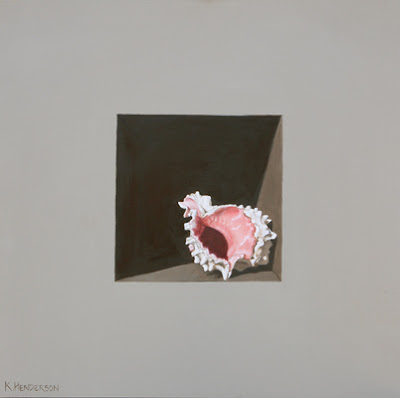 I've created 2 other paintings with this same shell. Stay tuned for further images. 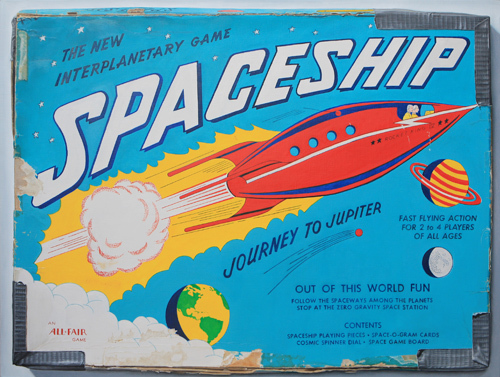 This space gun is one of my vintage tin toys. I like 'Setting the Stage' in a box because of the light and shadows. I have a few metal airplanes in my toy collection. All of them are well worn and show signs of a lot of play! 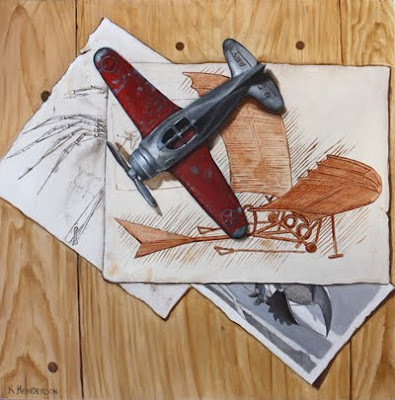 This trompe l'oeil shows one of these planes against a background of early plans for The Flying Machine. This is another in my Vintage Toy and Flight series. 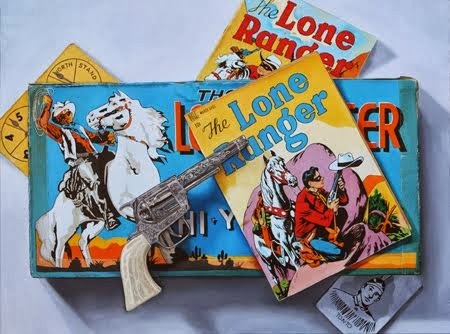 Someone asked to create a "Civil War" themed painting. 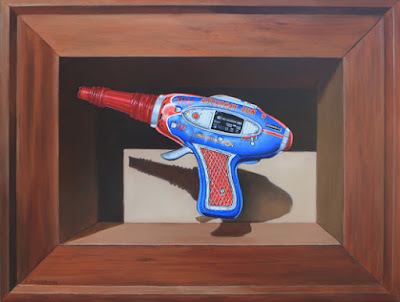 This Trompe L'oeil is the results. The background: During the Civil War J W Sword published a newspaper for the confederacy. As his paper supply ran out, he stripped the wallpaper from his home and printed the news on the back of the paper. The letter shows a confederate cancellation stamp and is addressed to Richmond. 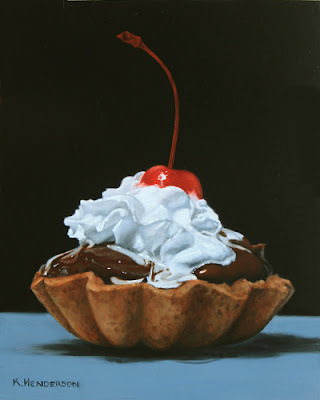 I wanted to create a fairly simple painting and so I chose another Chocolate Tart image. Who can resist chocolate with whipped cream and a cherry on top? 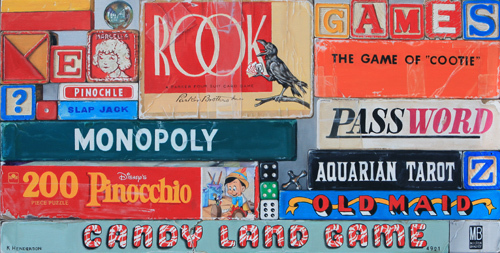 Two of my paintings have been accepted into the 2nd Biennale Grande at the Hubbard Musem of the American West. 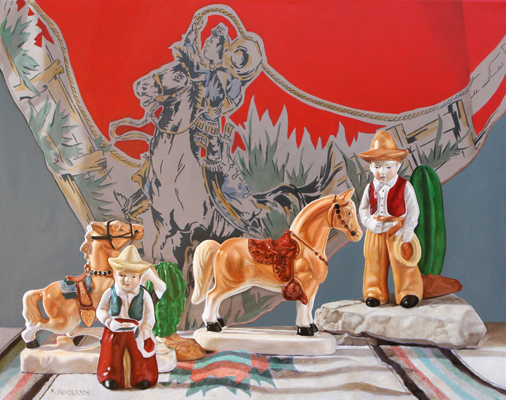 The 2nd Biennale Grande is a juried fine art competition that seeks to recognize and honor excellence in the contemporary visual arts of the American West. 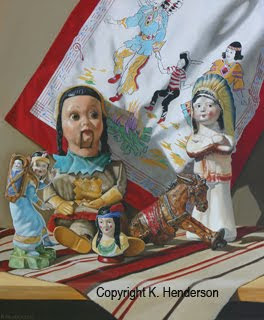 The art with be on display April 4th to July 15th, 2012 at The Hubbard Museum of the American West, 26301 Hwy 70 West,Ruidoso Downs, NM. 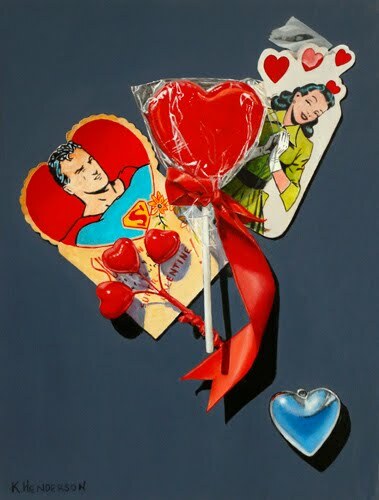 Who doesn't like to get chocolates for valentines day? And this one has no calories and will last forever. A sweet red cherry and sticky cordial cream covered by smooth milk chocolate. 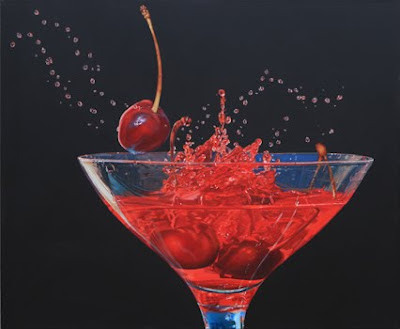 I don’t know if I wanted to simply capture the beauty of the cordial cherry or if I was just looking for an excuse to buy myself a box of chocolates! Yum! 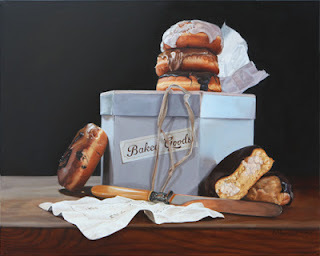 I had a request from a collector to create a painting using this vintage "Baked Goods" box. It was hard to decide which kind of pastry to include since all pastry is wonderful. I decided on Berliners (bismarcks, jelly donuts, Pączki, what do you call them?) I also included a favorite knife and linen napkin. 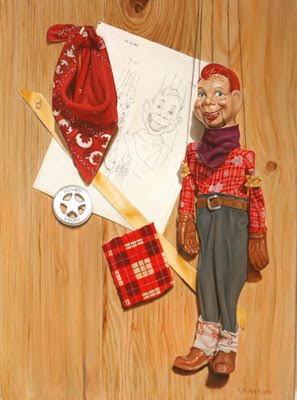 Do you have a favorite object you would like to have immortalized in a painting? Let me know. Commissions are considered.